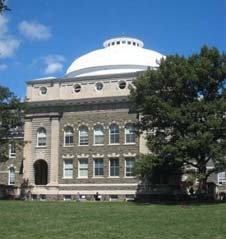 Assessment and conceptual design to replace and/or repair failed or deteriorated roofing systems at Morrill Hall (1868), White Hall (1869), and Sibley Dome (1902) - three of the original arts quad buildings, listed on the National Register of Historic Places. 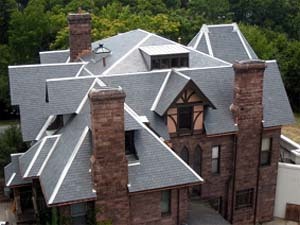 Morrill and White Halls (Cornell’s first and second buildings) originally had complete slate roofs and now have a combination of slate and modified bitumen. Sibley Hall Dome retains essentially the original galvanized sheet metal on a steel frame. Scope included an assessment of the deteriorated roofs, identification of the original roofing system and what other options might be appropriate; with respect to appearance, performance, and cost. Concept design and budgets were prepared, reviewed with stakeholders for each building, and the three projects have been included in the University's Capital Planning for the near future. 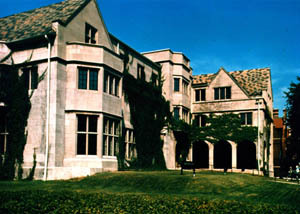 The large and complex 1880 mansion of a former Cornell president (now Cornell University Press offices) exhibits a host of deterioration problems due to original design conditions, water infiltration, soils and aging. Argus’ detailed Envelope Assessment addressed all needed exterior repairs, including stone masonry, original wood and stained glass windows, historic skylights, delicate woodwork and stucco decoration, flat-seam metal and slate roofing systems, and associated site work. Phase 1 design construction of the complete envelope from the eave line upwards was completed in 2012. Phase 2 for the exterior envelope from the roof eaves down and site work is anticipated for 2014. 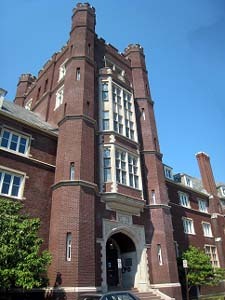 The 1912 Prudence Risley Hall (historic women’s dormitory) has several periods of partial and failed brick repointing, deteriorating parapets and turrets, cracks and deterioration in limestone, roof leaks and other masonry envelope deterioration. The Phase 1 project recently completed - the masonry and roof rehabilitation of the nearly 100’ tall Tower of the building - addressed the area of the most urgent work and also will serve as the template for overall rehabilitation of Risley Hall’s masonry. Construction completion (Tower): November 2011. 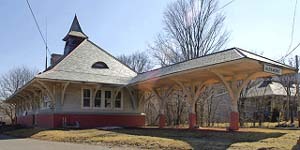 Conversion of the 1897 former D&H train station for use as the community's public library. Project scope includes programming and complete rehabilitation of the National Register Victorian station, exterior and interior, with new building systems, the addition of mezzanine space within the historic waiting room, restoration of original finishes, and an outdoor reading/program space under the canopy. Phase 1 of construction, the new slate roof, associated structural repairs and a small photovoltaic system, was completed in 2008. Phase 2 consisted primarily of structural and site work. Remaining interior work and exterior painting, was completed and the Library opened in May 2012. Despite being less than 40 years old and designed by one of the most prominent architects of the 20th century, Robert Venturi, the 93,500sf 1979 building is suffering significant distress and failure. As subconsultant to the renovation project architects, Kliment Halsband, Argus was asked to assess the failing masonry, and related conditions, determine the underlying causes and recommend repair solutions and budget. Following a detailed survey of conditions, review of original drawings, and initial hypotheses as to causes, Argus directed strategic probes by a masonry contractor to verify hidden conditions. Based on Argus’ report the SUCF incorporated repair of the exterior walls into the overall project and Argus assisted Kliment Halsband with design and preparation of construction documents for the walls, including masonry rebuilding & repairs, introduction of insulation and vapor barrier, new wall openings and complete window replacement. Construction is in progress. Restoration & upgrade project for the second largest instructional and meeting space on the Downtown Campus, containing 14 John Lithgow Murals. Programming and design included new environment for murals conservation, heating and A/C, lighting, window coverings, egress upgrade, restoration of finishes, AV system and furnishings. Key design concepts include: highly flexible room layouts, controlled lighting for mural preservation and varying use, an inconspicuous HVAC system zoned for the needs of the murals and the comfort of 12 – 120 occupants, and restoration of the room's historic color scheme. The c. 1930 Doty Building is an approximately 70,000 sf historic former school, built in the Collegiate Gothic Style with brick exterior bearing walls, and significant stone trim and decorative detail. 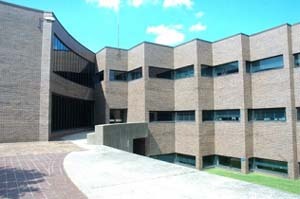 Argus measured the building and created detailed existing conditions drawings for the comprehensive renovation project. Drawings included Floor, Ceiling and Roof Plans, Elevations and Building Sections. Argus provided all architectural services for the new 4,000 SF, $3 million substation facility to provide campus-wide emergency power. Overall building layout and construction were driven by the generator and associated electrical equipment, so the architectural design challenge was to ensure that a windowless, equipment building would be complementary to the campus. 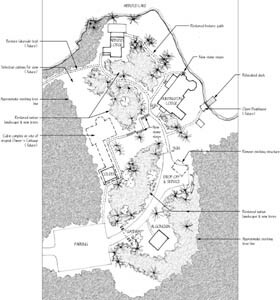 Concept Plan for restoration and rehabilitation for a camp/conference center on Arbutus Lake which includes William West Durant's 1898 Mossy Camp lodge and Archer Huntington's 1911 lodge. Master Plan includes reorganization of access and parking, landscape restoration, proposed demolition, facilities rehabilitation and expansion for program enhancement, including an educational retreat & conference/distance learning center. 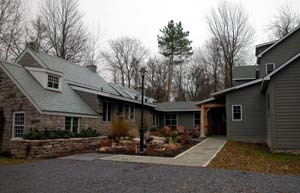 Rehabilitation of the 1930s home of Adirondack activist Paul Schaefer and 4,000 square foot addition for the Adirondack Research Library, archives and the Association for the Protection of the Adirondacks offices. 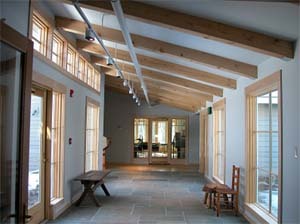 Old and new structures share common materials and a reception and exhibit space axially linking the iconic Adirondack Room of the Schaefer House with the Library and (visually) with the nature sanctuary beyond. An 8-well geothermal system heats and cools the facility. Two successive projects for the replacement of 529 wood windows in the five 1949 National Register Eligible original campus buildings. Scope of work included 15' high monumental windows and associated masonry repairs. 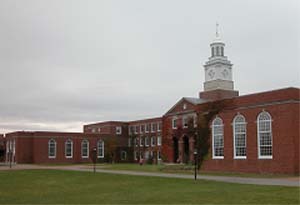 New wood windows were designed to current structural, energy and maintenance standards desired by the campus, as well as visually matching the originals. Argus successfully negotiated with NYSHPO to approve replacement of windows (vs. repair) and worked closely with window manufacturers to meet technical (and aesthetic) requirements for exceptionally large, operable windows. 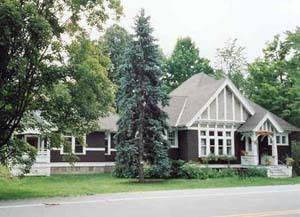 Conditions Assessment, Concept Plan & major addition to a 1907 Shingle Style community library on the Ausable River. To mitigate frequent flooding, Argus devised a strategy of replacing ground floor space with a (FEMA - funded) addition which also solved the library's crowding & accessibility problems, retrieving the pristine original interior & preserving the integrity of the historic building. 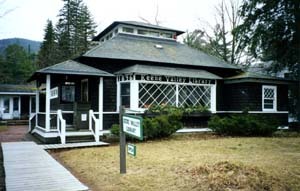 The project received an Adirondack Architectural Heritage Award in 2003. Conditions Assessment, design, and phased rehabilitation for the conservation and functional upgrading of 1896 Shingle Style library, which as significantly expanded and altered over the years. The first phase of rehabilitation included structural roof repairs, roofing, electrical system upgrading, and restoration in the original Reading Room, including hidden stabilization of the lantern and new lighting. Complete rehabilitation of a four story c.l922 Neo-Gothic former fraternity house as headquarters for the Seminary, including assembly spaces for the Seminary Community, and all administrative and faculty offices. As the building was undersized for the program, one of the major design challenges was to make efficient use of every square foot of space, including the basement, without expanding the building or destroying its historic character. Total accessibility for wheelchair users was also provided (long before the ADA). (1976, Janet Null, Project Architect for Harry Weese & Associates).